Millions of people in the Horn of Africa, particularly in Somalia, face a dire famine caused an extensive drought that was forecasted months ago. Still, the international community has failed to raise the necessary humanitarian funding, experts said on Capitol Hill today. The crisis has been exacerbated by the terrorist organization al-Shabaab's control of South Somalia, which restricts Western aid. On top of that, aid is complicated by U.S. legal restrictions pertaining to the funding of terrorist organizations. While humanitarian organizations grapple with geopolitical difficulties and funding shortfalls, people in Somalia suffer malnutrition, starve or walk for days to refugee camps across the border, members of the Senate Foreign Relations Committee heard in a hearing. Tens of thousands of people, mostly children, have already died, according to the United Nations, with more dying every day. In some areas of South Somalia, more than half of children suffer devastating malnutrition. "To the untrained eye, they appear close to death," said Reuben Brigety, the Deputy Assistant Secretary of State. During his trip to the region, Brigety witnessed a three-year-old girl sharing a cot with her father, continually moaning while covered with flies and mosquitoes piercing her skin. He met a mother who carried her Polio-stricken daughter on her back for nine days to reach a refugee camp. "As horrific as some of the images are," said Jeremy Konyndyk, the director of policy and advocacy at Mercy Corps, "we need to recognize that for every photo of a child in a treatment center, there are many more who have not made it that far." Every day 2,000 Somali refugees cross the border into Ethiopia, and another 1,200 cross into Kenya, according to the World Food Program. 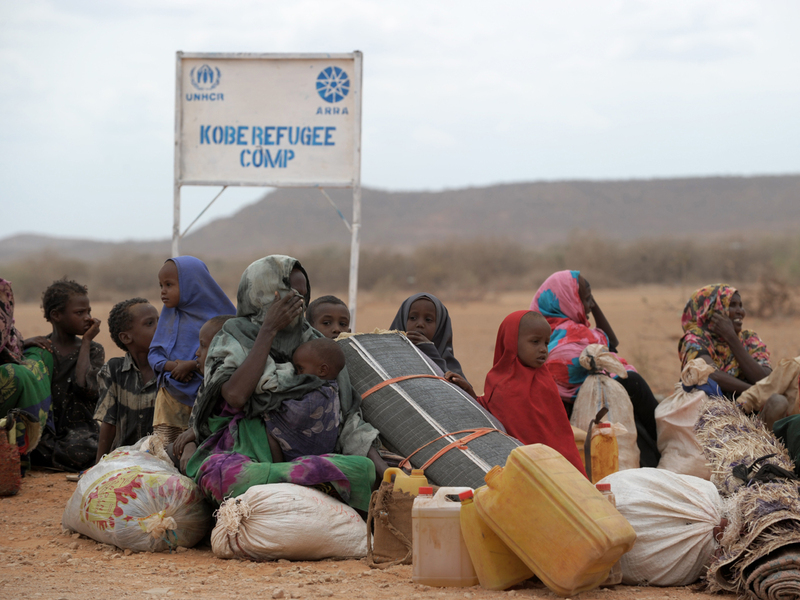 Already, there are more than 700,000 refugees in Kenya and Ethiopia, with another 1.5 million people internally displaced in Somalia. "There doesn't seem to be yet a global recognition of how severe this crisis is," Konyndyk said. The crisis, predicted months ago, was not a surprise, but still the international community has come up short. The region urgently needs $1.4 billion more in aid, despite already receiving nearly a billion dollars, according to Wouter Schaap, a director for the aid organization CARE USA. And the window of opportunity to save lives is closing, he said. Other then funds, the main hurdle facing aid organizations is al-Shabaab, a terrorist organization that restricts Western aid to South Somalia, where 60 percent of the famine victims live. Recently the organization has eased the restrictions, but they remain divided on the issue. They have also used force or the threat of force to prevent people from leaving the territory. The group is seen as a rising force in international terrorism and a threat to the United States. Last week, they were the focus on a House hearing chaired by Rep. Peter King, R-N.Y. The group often asks for "convoy fees" from humanitarian groups trying to deliver aid, which were considered under U.S. law to be illegal contributions to a terrorist organization until Tuesday, when the State Department eased restrictions. The announcement comes almost two weeks after the United Nations on July 20 declared a famine in the region, reflecting the slow response of the international community. Al-Shabaab only receives a small portion of its funding from taxing or diverting aid, according to Peter Pham, director of the Michael S. Ansari Africa Center. And most aid groups operate on a principled approach of not paying taxes or tolls, according to Nancy Lindborg, an assistant administrator at the United States Agency for International Aid. "The new guidance that was given over the last few days gives greater assurance and greater flexibility," Lindborg said, "but fundamentally this is a tough area to operate in." Still, the humanitarian groups lament that the eased restriction only applies to operations funded by the U.S government and not to those funded by U.S. civilians. The famine may help to defeat al-Shabaab, because it has revealed internal divisions and undermined their support from the Somali people, according to Pham.